1.In small bowl, whisk together garlic, 4 tablespoons oil, lime juice, cilantro, coriander, dried pepper, salt and black pepper. Place chicken in large zip-top plastic bag. Pour marinade over chicken. Seal bag and refrigerate 1 hour to marinate. 2.Remove chicken from marinade; discard marinade. Heat large skillet or wok over high heat. Add remaining 1 tablespoon oil and chicken, and cook 4 minutes, stirring occasionally. Add bell peppers and jalapeño, and cook 3 to 4 minutes or until peppers are crisp-tender. Stir in green onions and cook 1 minute, stirring. Add orange segments and cook just until chicken loses its pink color throughout and internal temperature reaches 165°, stirring occasionally. 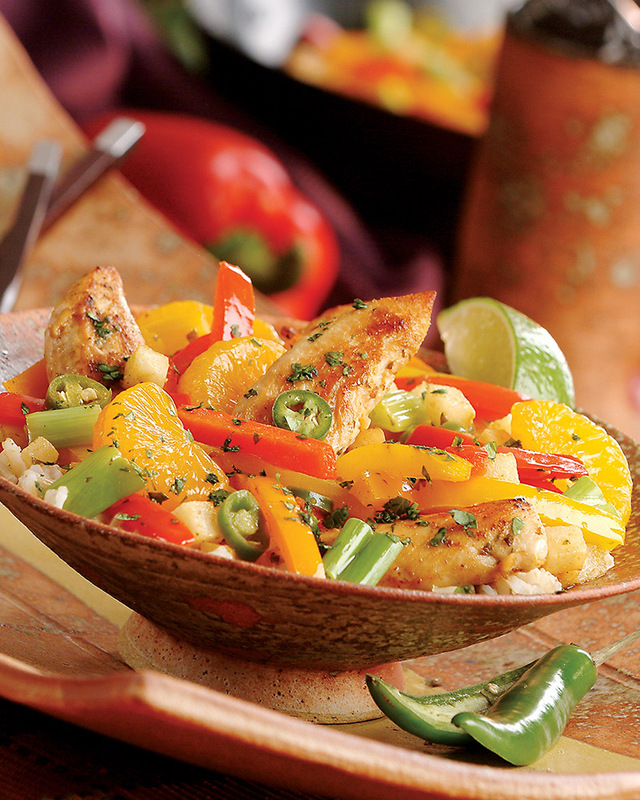 3.Serve stir-fry over brown rice garnished with cilantro and lime wedges, if desired. Stir-fries can be very versatile by using a variety of proteins, vegetables and grains. They are a great way to use up extra vegetables you have on hand. This recipe would also work great with shrimp as the main protein and you could substitute the rice for red quinoa or farro.